Gourmet Girl Cooks: Pizza with a Secret Ingredient in the Crust! Sunday evening I decided to try making a pizza crust without using any wheat. Not only did it not have wheat in it, but it had a secret ingredient that might surprise and/or shock you. Beginning last week I began eliminating wheat from my diet (mine only, not for hubby or the family). I am doing a little experiment to see if it might help me with some autoimmune issues I have been experiencing. This will make preparing my meals a little more creative, but I don't think it will be hard since I cook almost every day anyway. We do not eat out a lot, so other than reading labels more carefully (wheat is in almost everything, just like sugar is), I am going to give it a whirl. For instance, Saturday night, hubby had a side dish of ravioli in alfredo sauce with his chicken and salad...I just had the chicken and salad, no ravioli. Enough of that now...I snapped a few pics of our pizza below. 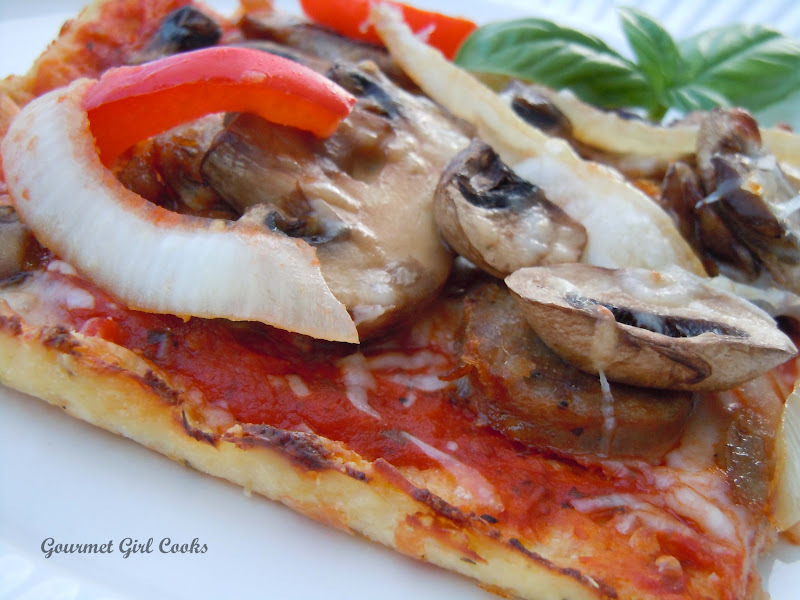 I read numerous "wheat free pizza crust" recipes and then tweaked this one a bit. This recipe made a huge pizza that fit in a 12x17 jelly roll pan / cookie sheet. I will unveil the mystery pizza crust ingredient at the end....first I want you to see the photos of the pizza as well as the recipe below. Enjoy! Pizza fresh out of the oven...looks good, doesn't it? Last picture...it looks good, doesn't it? Have you guessed the secret crust ingredient yet??? Okay...brace yourself for the unveiling of the secret ingredient...you aren't going to believe it...it's actually hard for me to believe!!! Cook cauliflower florets in about 1 inch of water until almost tender (about 10 minutes). Drain water and continue cooking cauliflower in dry pan over heat while mashing with a potato masher. Let mashed cauliflower cook about 5 minutes in open pot to allow more liquid to evaporate. Lay out a tea towel or dish towel and line with several layers of paper towels and spoon the mashed cauliflower on top and allow to cool slightly. Add several more layers of paper towels on top so cauliflower is completed encased. Roll towel up, and squeeze excess water out of the cauliflower; squeeze it as dry as you can. Transfer to large bowl. Add 1/4 cup of oil, eggs, and 1 cup of mozzarella, ½ cup of parmesan cheese, 1/4 cup of almond flour and all of the spices. Mix well. Preheat oven to 375. 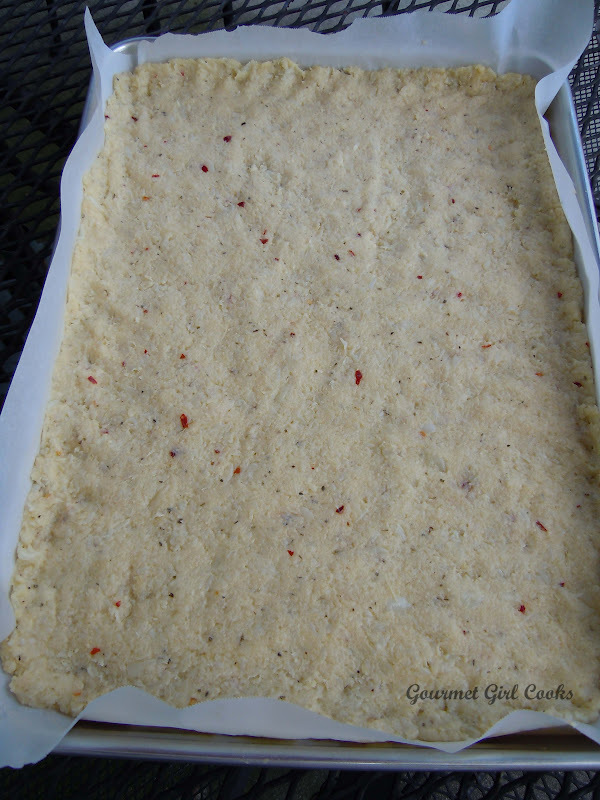 Line pizza pan with parchment paper and coat with about 1 tablespoon olive oil. Pour the cauliflower mixture into the pan and press it out flat and thin (less than 1/2 inch thick, the thinner the better). Bake for about 25 minutes. If it has not browned yet, remove from oven and increase oven temperature to 425 degrees and lightly brush top of crust with about a tablespoon of olive oil and return to the 425 degree oven for about 5 minutes or until lightly golden brown. 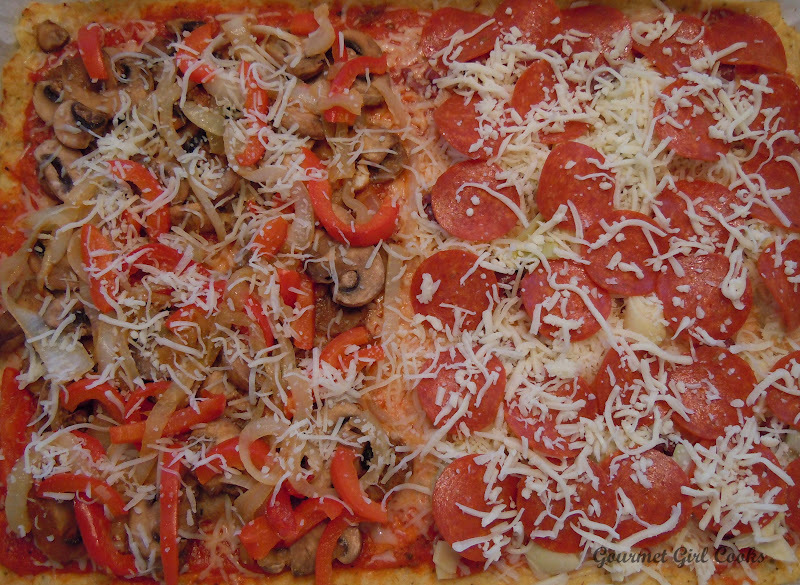 Remove pizza crust from oven and spread with pizza sauce, remaining 2 cups of shredded cheese, your choice of toppings, etc. Lightly sprinkle with additional parmesan, if desired. 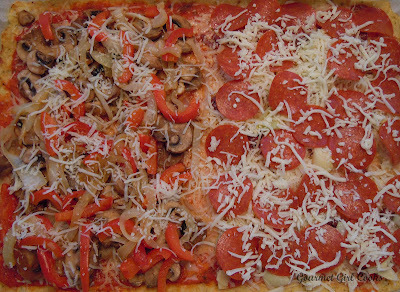 Return to 425 degree oven and bake about 10-15 minutes until toppings are heated through and cheese is melted. To brown the top, place under broiler for a few minutes (3-5 minutes) until bubbly and browned. Let cool a few minutes. Cut and serve. 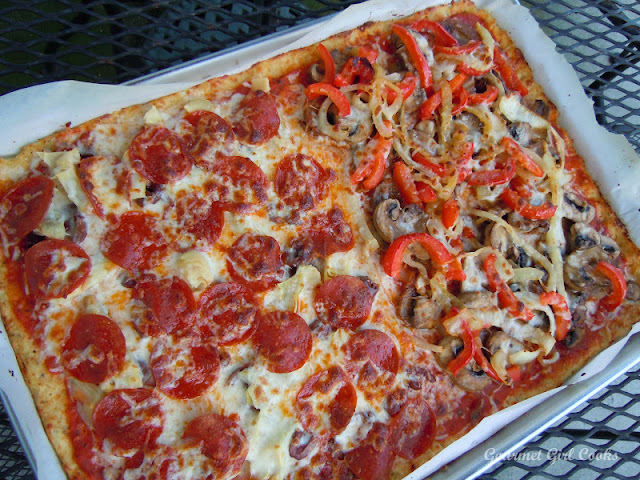 Note: This pizza crust is not “crispy” like regular pizza crust…it is solid, but soft (fork & knife). Next time I make it, I may make it into 2 small pizzas instead of 1 large. Some people suggest flipping the crust over to allow it to bake and dry out more (my pizza was entirely too large to flip). This pizza tasted like "regular pizza". You could not taste the cauliflower in the crust...the only difference was the crust was soft or limp compared to regular crust. Hubby rated it an "8 out of 10" (with 10 being the best) and said if the crust could be "crisper" it would be a 10. I will continue working on modifications to see if that can be done. It is tasty and it does satisfy your urge for pizza. ***Personal Note: This pizza was very tasty but I do not believe the crust was typical "pizza crust like" in texture, so if that is what you are expecting, you might be disappointed. However, in terms of flavor, it was delicious -- it doesn't taste like cauliflower in case you were wondering. Hubby and I had the leftovers reheated for dinner this evening (Monday night) and I must honestly say...it tasted REAL good -- as in noticeably better than yesterday for some reason. I wasn't able to reheat it in the oven (hubby overstuffed the storage drawer underneath my oven when he put the baking pan away last night and I can't get to any of my baking pans, cookie sheets, etc. )...so I decided to reheat it in on the stove in a large non-stick skillet brushed lightly with some olive oil to help the bottom of the crust brown when it reheated...and guess what??? It not only browned nicely, but it gave it a wonderful flavor. This makes me think that next time I make this I need to find a way to brown the pizza crust nicely before topping it as well as make several smaller pizzas instead of one humongous one. Yesterday I would have rated it a 7.5 (hubby rated it 8 yesterday)...today it was pretty darn close to a 10...a solid 9.5. I will keep experimenting and tinkering around with it...but for the first time making this, not knowing what to expect...it was surprisingly good. How interesting!!! Did you figure out the nutrition information for the recipe? Curious how it compares calorically. I like cauliflower but my family could use some new ways to eat it! 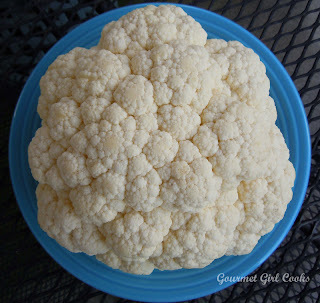 :) I'll for sure try it next time I see cauliflower on sale, should be in season soon! Rachel...no, I haven't tried the quinoa pizza bites -- I will look for them. 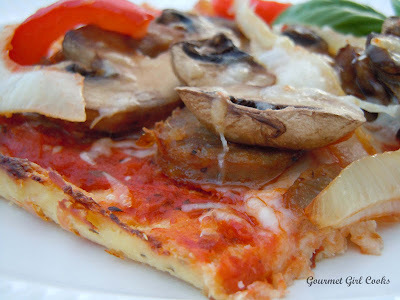 It was hard enough just getting my hubby to try the cauliflower pizza...but he liked it. The PB&J bites sound delicious too! P.S.--the cauliflower pizza crust really needs to be eaten with a fork as it is a bit flimsy -- if you didn't make as large of one as I did (instead make 2 smaller ones), you could flip the crust over and bake it on the other side too that would stiffen it up better. That recipe looks delicious Rachel! I actually have bought the Italian Prune Plums from Costco before -- I love them. Haven't noticed them there yet this season -- either than or I missed them. I have only ever eaten them raw...never cooked with them. They are really hard to find -- not sure why the local grocery stores don't carry them. 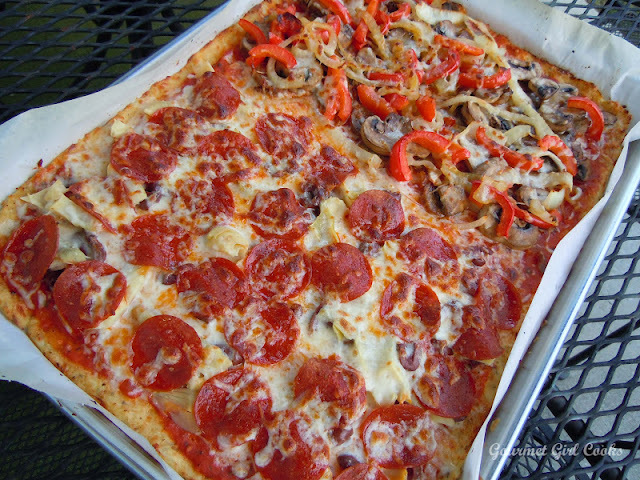 Hope you like the pizza crust -- some people make them smaller and flip them over and cook a bit on the other side -- they like it better that way. The one I made was just too big to flip. Let me know how it goes! This was delicious! 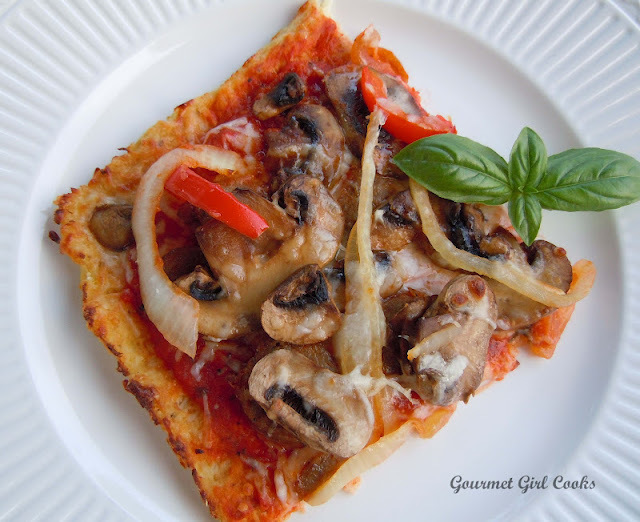 I was happy with it but my hubby would like to work on the crust a bit more... pizza was one of his favorite foods and the crust played a big role in that for him. Have you had any success with making it more crusty? You can use shredded zucchini also..I'm making it tomorrow.. 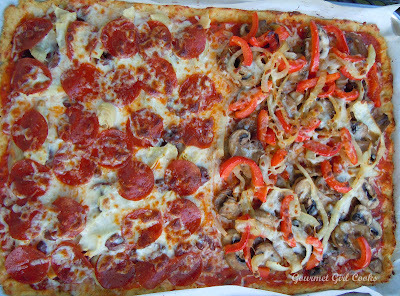 I know this is an old post, but to flip a large crust (to brown both sides) couldn't you invert a second pan on top of the first and just flip it onto that one?